I cookie aiutano bdrclan.com a fornire i propri servizi. Navigando sul sito accetti il loro utilizzo. ATC EDIZIONE #9: TEMPO DI MEDAGLIE! 3 MESI INCLUSI I TEST PRELIMINARI, 10 BATTAGLIE, 120 GIOCATORI, CIRCA 20 CLAN O GRUPPI COINVOLTI, OLTRE 9 NAZIONI: QUESTA E' L'ATC!!! I RECLUTAMENTI PER ARMA3 SONO APERTI. 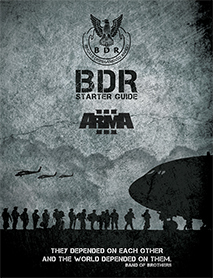 IN AREA DOWNLOAD E' DISPONIBILE LA STARTER GUIDE ARMA3. Un prestigioso torneo organizzato da Bohemia Interactive! E il primo match BDR vs gli sviluppatori del gioco! ROLLING THUNDER #26, IN PROGRAMMAZIONE DOPO LA CAMPAGNA ATC #9! ROLLING THUNDER, IL PIU' GRANDE EVENTO DI CARRI DI ARMA! Il Clan BDR festeggia 10 anni di attività! Da Settembre 2008! Benvenuti Kajin e Alexander, nuovi BDR! DAL CLAN: NUOVO SERVER BDR! ATC #9: SIGN UP TIME! ATC #9: ARMA3 COMMUNITY EVENT (sitrep-00229)! – Warm-up battle on Jan. 13th on Lythium. Start of the campaign one week later (Jan. 20th). The winner of the warm up battle will be the attacker in the first battle. – Meeting to form the two sides: Jan. 6th at 19.30 UTC. In that occasion we will make a draw to decide who is going to attack in the warm up battle. – Maps: at least 4 battles on Lythium, plus other 4 battles on Rosche and Altis. After the first part on Lythium, the attacker will choose which map/area to attack. – We urge all interested to sign up now! Welcome to the RECCE Arma Mission Challenge. With this challenge we aim at creating missions based on Actual missions conducted by Recce Operators between 1974 and 2014, against primarily Soviet forces (USSR, China, Cuba, Angola etc). Some of these missions were joint-ops with other Special Forces units. This challenge series officially started on 1 November 2018. Each unit plays the mission, and if you complete it, you upload your vid to your YouTube channel. We score your game-play on points like Briefing, Planning, Strategy, Movement, Execution etc. The winning team wins a prize for each of its members. PATCH 1.86 MERCOLEDI' 28 pomeriggio. Scaricate subito! SITREP 00229: Arma Tactical Combat is hosting a large-scale Player vs Player event soon, for which they recently opened sign-ups. Make sure to check it out if you're interested in participating! SCARICA LA NOSTRA GUIDA ED ENTRA FACILMENTE A GIOCARE CON NOI! Copyright © 2008-2015 BDR Clan. Tutti i diritti riservati.